Floral Cindy! My Fan made PPGZ!. I made a recolor of Bell, so i could turn her 2 my Fan made character Cindy!. Wallpaper and background images in the powerpuff girls Z club. 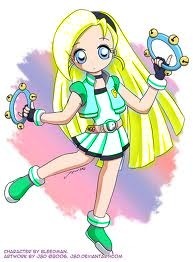 This powerpuff girls Z fan art contains anime, comic, manga, cartoon, comic buch, karikatur, and comics.